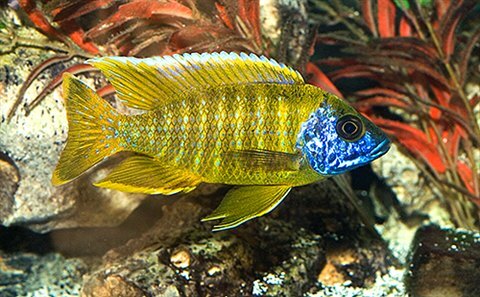 Buy live Sunshine Peacock Cichlids from a trusted breeder. All orders shipped to your door with a live arrival guarantee. Any fish that are DOA can be replaced or refunded. This is one of the more popular peacock cichlid species from Lake Malawi. The Aulonocara sp. "Stuartgranti Maleri" (Marleri Is.) or Sunshine Peacock is a species of Aulonocara that is native to the waters around Marleri Island. There are several closely related species of the "Stuartgranti Marleri" with different colors. however the Sunshine Peacock from Marleri Island is the popular species that features a bright yellow body with a dazzling metallic blue color on the lower portion of its face. The Marleri Peacock has often been confused with the Benga Yellow Peacock. Though they are similar in appearance, the Benga Yellow or Aulonocara baenschi doesn't grow to be as big as the Aulonocara sp. "Stuartgranti Maleri". The Ruby Red Peacock is a popular line bred color variant of this peacock cichlid which features a dark red color. The German Red Peacock is also a popular, closely related, red variant of the Chipoka race of this fish that is not native to the waters of Lake Malawi but was actually line bred in Germany. The Aulonocara sp. "Stuartgranti Maleri" (Marleri Is.) or Sunshine Peacock is one of the more mild mannered species of Aulonocara from Lake Malawi. Though these fish are typically peaceful, a dominant male can show increased levels of aggression towards other Aulonocara species. A breeding male will also show increased levels of aggression towards tankmates. Some compatible fish are the Eureka Red Peacock, the Red Shoulder Peacock, and the Electric Blue Ahli. Sunshine Peacocks are native to the hard salt waters of Lake Malawi in Africa. A home aquarium should mimic their natural environment. The substrate should be sand or fine gravel and there should be plenty of rocks to create caves and passageways for the fish to claim territories or seek protection. The water temperature should be between 78 - 82°F with a pH between 7.8 - 8.6. Additives like Cichlid Lake Salt and Malawi/Victoria Buffer will condition the aquarium water for African cichlids. Sunshine Peacock cichlids are carnivores and should be fed a variety of foods that contain a good amount of protein. Plankton based flakes mixed with commercially prepared cichlid pellets and live (or frozen) blood worms or brine shrimp, are good choices for their diet. Such foods will help bring out the bright yellow and blue colors in these fish. This a video of full color, show male, Sunshine Peacock cichlid. The bright yellow color is what makes this Peacock cichlid so popular. You can visit this trusted breeder on eBay to order Sunshine Peacock cichlids just like this one. The Sunshine Peacock cichlid is sexually dimorphic, which means that the males display bright colors and the females remain a dull grey/brown color. The male Sunshine Peacock develops a bright yellow color as it matures, which covers most of it's body. It also develops a metallic blue color on the lower half of its face. Females maintain the dull grey/brown color and show a little hint of yellow on their belly. Like all Aulonocara, the "Stuartgranti Maleri" or Sunshine Peacock cichlid is a mouthbrooder. While spawning, the female will pick up and hold the eggs in her mouth to protect them. It is a good idea to keep several females with one male when breeding. This will help spread out any aggression displayed by the male.